TripAdvisor names NRC one of the Top Fishing Charters in the U.S.
NRC was named one of the top 20 fishing charters in America and #1 in Montauk by TripAdvisor! Sincerest thanks to those who have fished with us. Your many reviews and recommendations have gotten us here! A 43’ Lowell sailing with 1-20 passengers. Along with the beautiful beaches and quaint shops, Montauk is home to the largest recreational fishing fleet in New York state. Whether a novice or a pro, all are welcome aboard the November Rain. Every trip is tailored to meet our customers' needs. Looking for the perfect party venue, or spending a day with the kids? We'll make sure you have a great time on the water no matter what your plans. Ready to fish? We're ready to have you aboard! Tell us what date you're interested in and we'll let you know what times are available. Did you charter a trip with us, or do you just want to see what our charters are like? If so, check out our gallery. November Rain Charters fishes both inshore and offshore, with every trip including the finest tackle, bait, ice, fish cleaning services, and a courteous and fun crew. The November Rain is perfect for comfortably accommodating groups of up to 20 people for fishing trips, sunset cruises and private parties. Captains Jill and Steve welcome beginners and experienced anglers alike, as well as families and children. 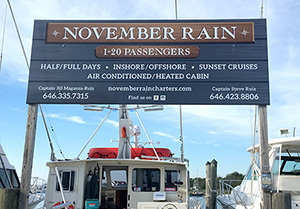 Call or email us to book your charter or party aboard the November Rain today.